With the solar energy industry reporting that the second quarter of 2012 was the second largest quarter in history, there was "tremendous enthusiasm and vitality running through the entire solar industry value chain," said Rhone Resch, president and CEO of SEIA. More than 15,000 solar energy professionals representing 100+ countries gathered for North America’s largest and most comprehensive solar industry event to view first-hand new technology innovations and to meet and network with the 900+ exhibitors, including more than 200 first-time exhibitors, occupying nearly 300,000 square feet of space. SPI is presented by the Solar Energy Industries Association (SEIA) and the Solar Electric Power Association (SEPA). CEO panel discussion explored renewable portfolio standards, net metering, regulation, storage, grassroots support for solar and the future of the investment tax credit. Panelists were: Tom Doyle, CEO of NRG Solar; Jurgen Krehnke, Advisor to the Board of Management, SMA Solar Technology AG; Peter Marte, CEO, Hannah Solar; Nancy Pfund, Founder and Managing Partner, DBL Investors; Eric Silagy, President, Florida Power & Light; and, Thomas Werner, President & CEO, SunPower Corporation. Introduction of 72-cell high efficiency modules, advanced inverters and energy storage solutions. CPS Energy President and CEO Doyle Beneby named 2012 Utility CEO of the Year by SEPA for his leadership in integrating solar power into the company’s energy portfolio. SEIA’s report of the Top 20 Corporations Using Solar for their operations included Walmart, Costco, Ikea, Johnson & Johnson, Kohl’s, General Motors, FedEx, Walgreen’s and Bed, Bath & Beyond. The top 20’s installations annually generate an estimated $47.3 million worth of electricity. The first Global Solar Summit, presented by Global Solar Alliance (GSA), bringing together worldwide industry leaders from the private and public sectors was announced; will be held in Milan, Italy, May 7-8, 2013. Local solar facilities tours were heavily in demand by SPI ’12 attendees—Advanced Solar Photonics (ASP) photovoltaic manufacturing facility of 400-watt series of mono-crystalline PV modules; 6-megawatt solar farm Stanton Solar Project at the Curtis H. Stanton Energy Center; 1-megawatt rooftop PV system at the Orange County Convention Center. Exhibitors report that SPI ’12 delivered results. Microinverter technology company Enphase Energy, a five-year SPI exhibitor and three-year event sponsor, “looks forward to SPI every year to connect with our entire industry—from installers and integrators, to financers, policymakers and partners,” according to Marketing Director Heather Kernahan. “We gain significant return on investment from the time spent and relationships made there,” she added. View webcasts of the CEO panel and Resch and Hamm presentations during SPI ‘12. 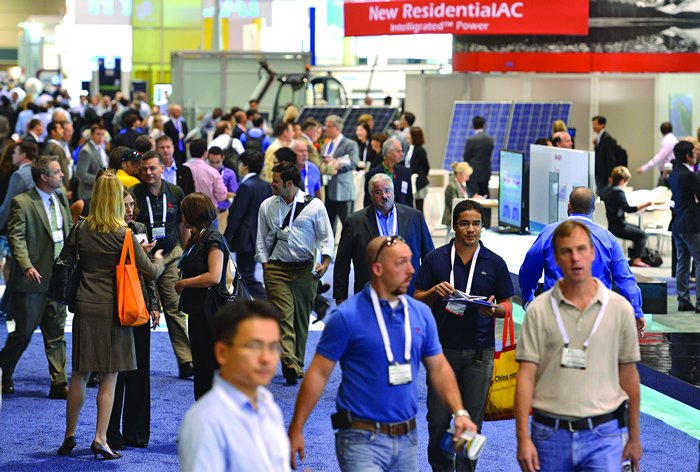 McCormick Place, Chicago, Illinois, will host Solar Power International 2013, October 21-24.